"This recipe is so simple, it doesn't even have a name. I just call it Trout. This is such an easy weeknight seafood dinner. It's a really nice way to cook fish, especially if you're new at cooking fish." Melt butter in a saucepan over medium-low heat until butter smells toasted and is golden brown, about 1 minute. Turn off heat. Line a baking sheet with a piece of aluminum foil. Place trout onto foil; open trout so skin sides are down. Drizzle each trout with about 1/2 teaspoon melted butter. Generously season with salt and black pepper. Move an oven rack to 5 or 6 inches below heat source and preheat oven's broiler on high heat. Broil trout until opaque and barely firm to the touch, 2 or 3 minutes. Remove from oven. Return pan of melted butter over high heat; stir in lemon juice and parsley. Bring butter sauce to a boil; whisk to combine. 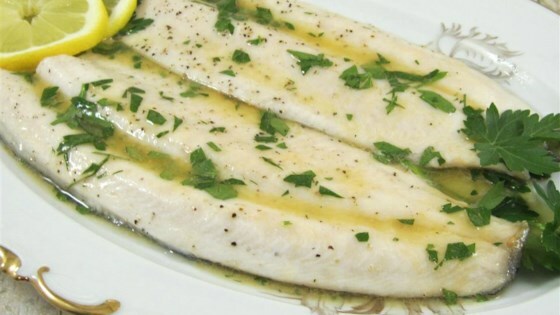 Serve trout on plates and drizzle with butter sauce. Simple and easy to make, but most of all delicious! I think this could be made with other fish such as salmon, cod, etc. Chef John nails it again. Absolutely perfect. Best recipe for trout I have ever done!!!!!!! This may be the only way I ever eat trout again! I sauted fresh spinach leaves in the butter and added it as a garnish. it turned out great!